We have invested in the latest light weight poles allowing us to reach those high level windows. 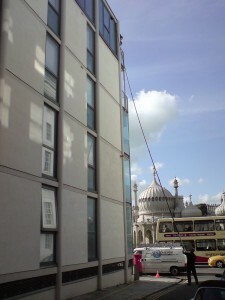 When water fed pole window cleaning was first introduced there were a limited amount suppliers of equipment, most equipment available was heavy and fatiqued the operator quickly on high level cleaning. This reduced the quality of the end results. New technology has allowed us to invest in water fed poles that are less than half the weight of the original poles giving superior cleaning results.